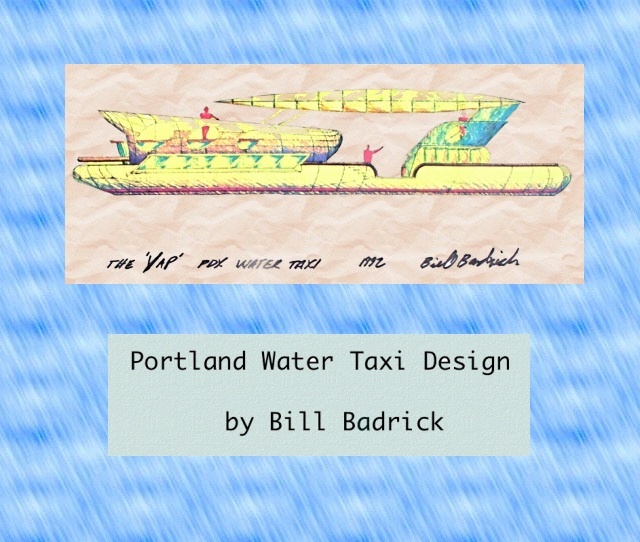 To provide a regularly-scheduled affordable Water Taxi local trip service in the central Portland and Willamette River areas linking North/South and East/West communities. To provide a significant enhancement for entertainment, convention and tourismbusiness and cultural activities by providing a venue for positively experiencing the City of Portland. To provide revitalization to existing waterfront communities and locales, and to spur redevelopment of properties and facilities along the Willamette river-front. To link Parks and Recreation Areas all along the river-front to local and regional communities by accessible water craft service, running from Sellwood / Oaks Park to Kelly Point Park / Sauvie Island. To provide an alternative economic form of daily travel and commuting to alleviate congestion, parking and local environmental impacts on the central city. To enhance the bicycle and pedestrian networks by developing multi-modal overlapping travel and recreation functionalities. To create opportunities to build connections to other regional centers from Lake Oswego and Oregon City to Vancouver, Washington. We are a 501c3 Corp. that is working to create a new ‘Community Model’ facility. We have a 77,000sf. 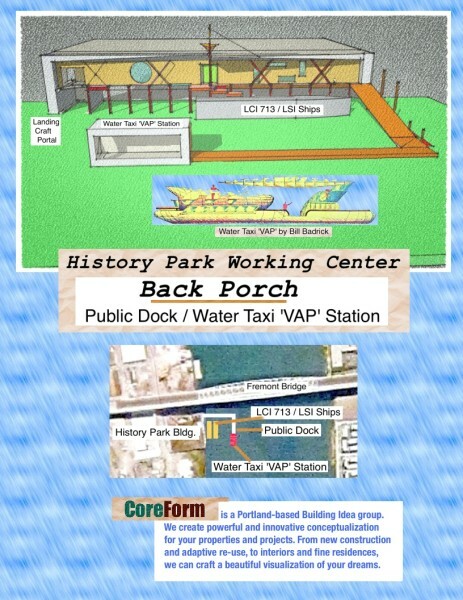 historic dock building on the Willamette River in downtown Portland that is being donated to our cause. Our Vision is to develop a Working History Park. It will be a place for community groups to come, free of charge, and showcase the craft, skill, and work they do and did. We see this as a model for people across the country and the world. We picture Native Americans weaving baskets and carving totems, culinary experts cooking up historic recipes for events, boat builders rigging up small sailing ships, weavers spinning yarn and making garments, and on and on. Each of our groups will display their history, but also live it right there day in day out. The roof of the building will be turned into a huge grassy park right up above the river. Our dock will become a public way-stop for canoe, kayak, and the dragon boats. We will host the 154 foot LCI 713 as it is being restored and offered for tours daily. We have a design ready for a water taxi that can serve the whole city waterfront. We probably need higher gas taxes in the United States. We desperately need a federal carbon tax. But do we really need higher federal gas taxes? As Congress debates highway-funding stopgaps and Oregon’s most influential transportation experts get ready for an Aug. 4 forum about the future of U.S. transportation funding, maybe it’s time for urbanists to shed our Rockefeller-funded patriotic umbrage drag and stop pretending that we really, really care about the sanctity of the Federal Highway Trust Fund. All our states have gas taxes. Raise them 25 cents each (or whatever) and they can do the job just fine. Helsinki is on a campaign to reduce auto reliance. One of their strategies is integrating a trip-planning tool with a single-payment system for a variety of forms of mobility, as outlined in this Citylab piece. Been out of town, and been watching a little sporting event down in Brazil. Now that that’s over, ’tis time for another open thread. The Powell/Division project is starting to heat up. A series of outreach meeting will occur in the next couple of weeks, and a few new documents are available. Was in Seattle last week. While there are parts of Seattle transportation planning that I’m happy not to see replicated here (such as the boring machine stuck below the harbor), I was constantly impressed by the amount of exclusive bus lanes, both on freeways and on surface streets. Beaverton’s planning for the South Cooper Mountain area is also being promoted to the public. Transit isn’t on the agenda directly, but the proposed street network includes several new arterial routes over Cooper Mountain, making bus service through the area potentially easier. C-TRAN budgets $6.7M in matching funds for the Fourth Plain BRT project; the project (which unfortunately will be mixed-traffic BRT) will start construction next year, and open in 2016. One interesting question: The project has long assumed that the CRC and Yellow Line extension would get built, as of now, that’s not happening. Some area freeways going high-tech. Next week, the new SunLink streetcar line in Tuscon, AZ opens, featuring 8 new vehicles from Oregon Iron Works. The 6th Annual Oregon Transportation Summit (September 15th) will focus on safety as the key topic. My sometimes debating opponent (stop spacing, value of streetcars) Jarrett Walker of Human Transit fame will be the keynote speaker. The 2014 Summit will have a considerable focus on safety and its relevance to creating livable communities. In the plenary session, Minnesota DOT’s Sue Groth will describe her state’s implementation of programs as part of its Toward Zero Deaths philosophy. In a two-part response, Oregon DOT’s Troy Costales will describe efforts across the state regarding TZD and Leah Treat, Director of the Portland Bureau of Transportation, will describe what TZD means to the city. There will also be a workshop in the morning on system-level safety (“Safety Is More than a Buzzword”) featuring Utah DOT’s Robert Hull. In the afternoon, a workshop on project-level safety will pay particular attention to the safety of bicycles and pedestrians.